When I travel the world, I have a preference for active travel, whether hiking, walking, bicycling or Nordic skiing, to name a few. It's not only a way to acquire an intimate contact with the land and its people, but I can stay in shape while having fun doing it. So, with the rising obesity rates in the U.S. -- among children, the obesity rates have tripled; and among adults, almost 40% are considered obese -- I wonder how some countries get their citizens to work out. Most notably I'm thinking about Denmark. Sure, when we think bicycle-friendly countries, The Netherlands always come to mind. But, in fact, after Holland, Denmark has the next highest rates of cycling in the world. I've bicycled all over Denmark and have found it a pleasure to ride in a country where the bike is king. I had little worry that a car would slam into me from the rear or cut in front of me as it made a right turn. 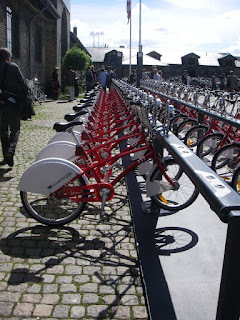 I had no problems taking my bike on the trains nor any problem navigating Copenhagen's city center. Dedicated bike trails network across the country that has the most cyclists in not just Copenhagen but also Denmark's two other big cities: Odense and Aarhus. For example, Denmark is networked with over 6,000 miles of cycle routes and the city of Odense is covered with some 300 miles of bike paths. In Copenhagen, some 36% of people get to work by bicycle, compared with 29% by car and 28% by public transportation. So what is Denmark doing right and what are we doing wrong? Some would say that Denmark has such a small population that it's easier to get people to bicycle. Yet, even in cities, like New York City where I live, cycling is not all the rage. And, it's hardly safe. In fact, I have long stopped biking in Manhattan because of near collisions with cars, trucks and taxis. The bike lanes are not separated from traffic, which means anything goes. (Cars typically park or disgorge their passengers in bike lanes.) It's not easy to park your bike safely should you want to shop, nor can you easily find a place to pump up your tires, grab a drink of water from a fountain or find a bathroom that a cyclist can easily drop by. Then there's the problem with the out-of-control cyclists, most notably bike messengers or delivery people who ride on sidewalks or the wrong way on streets, or run the red lights (just as many cars do) which has resulted in a significant number of pedestrian accidents. And, of course, there are plenty of cities in the U.S. -- Tampa, Florida, for one -- where cars rule and where even pedestrians take a risk crossing the street. No wonder it's hard to get people bicycling. In Denmark, it's not just kids; people in all age groups cycle, from young to old. And they don't just cycle for pleasure. It's a way of life, whether they're going shopping or heading to work. And, the Danes don't cycle just because it's healthy or because it's good for the environment. Rather, getting somewhere by bicycle is faster and more fun than doing so by another method. Denmark has realized that cities that are bicycle friendly are people friendly and infrastructure that encourages this also encourages social interaction among its citizens, benefits the economy because workers are not stuck in traffic jams, and makes for a more attractive urban environment. 1. Bicycle parking facilities are conveniently located near shops/main train stations; are covered; well lighted; have video surveillance cameras as well as bathrooms, water fountains and air pumps. 2. 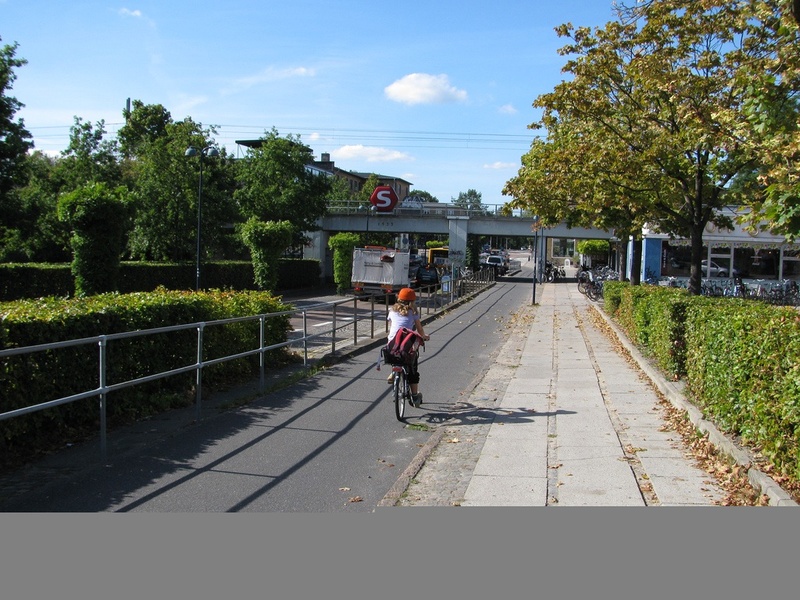 Bicycle racks are also conveniently located, with some installed beside kindergartens. 3. 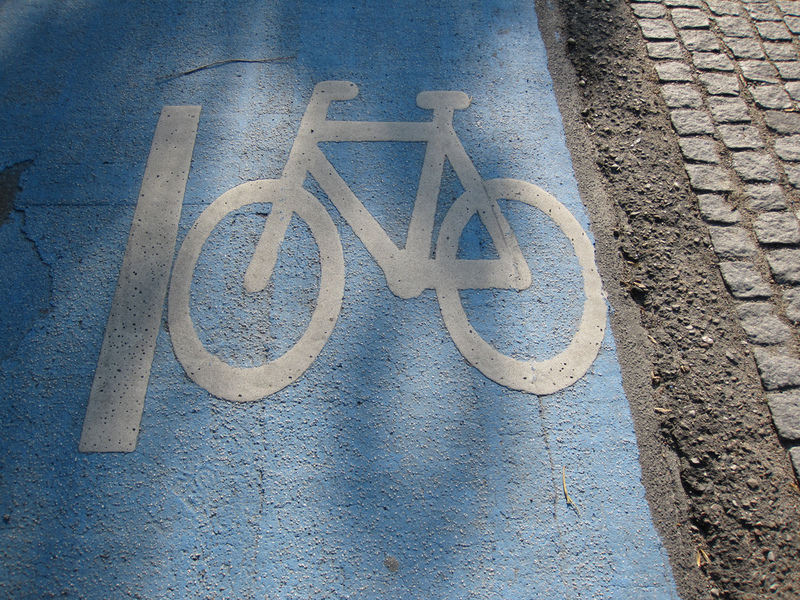 At intersections, bike lanes are painted with a bright blue bike icon to alert motorists. 4. Children not only learn how to ride a bike before first grade but safe cycling is part of some school curricula. 5. Bike lanes are preferentially de-iced and cleared of snow so that the citizens can bicycle in the winter. 6. Trouble-shooters are employed to traverse bike lanes and determine and report if there are potholes or other surface problems. 7. Cycling marketing/promotional campaigns are not just about print and television ads, but rather are quite innovative involving bike touring programs for seniors, having parents test out bike trails to haul their kids, partnering with businesses by giving them a fleet of bicycles their employees can use during the day for short business treks, giving out complementary bicycle lights that don't use batteries as well as seat covers and water bottles. 9. Some traffic lights are timed to coordinate with the speed of cyclists, rather than cars, and there may be a special bike traffic light. 10. A GPS system is being utilized so that a stolen bicycle can be tracked. 11. Copenhagen has plans for bike-through shopping facilities; a new bike sharing program; more and wider cycle paths, including those where the car stop white line is way behind the cyclist which is favored when the light turns green. 12. Denmark promotes cycling by integrating the cooperation of governmental and non-governmental agencies and organizations as well as private companies. It works because everyone knows that a city that respects their cyclists and where cyclists respect other citizens is a city that's more livable for all. I just posted on FB a link to a Dutch website called "Friends of the Bike". For 8 Euros you can join & that gives you access to over 4000 B&B"s that charge 19Euros pp - if you arrive on a bike or by other non motorized means. While they're mostly in Holland, Germany & Belgium - the network is expanding all over Europe. And I also love bike friendly cities - wish there were more of them. Hi Leigh, Thanks for that information. I love to find out about bicycle-friendly operations. Thanks, Leigh! It's awesome to know more ways to enjoy cycling! I never been more fascinated than to watch New York cyclist courier maneuver their way around Manhattan with its crazy traffic. Great article! Hi Blade, Yeah, NYC bike couriers do some crazy maneuvering. Definitely not my thing. Glad you liked my article. This was fascinating! Really shows what can be done when biking is made a priority. I live on Cape Cod where lots of people bike in summer, but it is dangerous to bike on roads. I'm an innkeeper and often advise guests on where to bike. Last year there was an accident, actually, and a boy was killed by a motorist. He was simply walking his bike along the side of a highway. This has sparked a movement to create a designated bike path/route between Wellfleet and Provincetown, which will happen, fortunately, because a grant was obtained. Still, we are so far from what you describe in Denmark. Thanks for this intimate look at biking there. It very interesting to see how other countries treat bikers. The United States needs to get into the game when it comes to alternative forms of transportation, especially when it has the double benefit of helping us be healthier. It makes perfect sense - you get to see the country or town you're visiting AND get a workout. In the winter around here (Michigan), I see people riding bikes with snow tires and feel like they've really got it together. you wrote "Rather, getting somewhere by bicycle is faster and more fun than doing so by another method. Denmark has realized that cities that are bicycle friendly are people friendly and infrastructure that encourages this also encourages social interaction among its citizens, benefits the economy because workers are not stuck in traffic jams, and makes for a more attractive urban environment." seems to me those ideas -- and many others you've described here so well -- are both inspirational and exportable. thanks for the story, which also makes me think it's time to visit friends who are now living in Odense. Hi Alexandra, Oh, my. What a horrible story about the fatal bike accident. That's all too common. Hope they end up creating a dedicated bike path. It'll be great for the whole community. Hi Living Large, Yes, it's funny how we're always mentioning statistics about obesity in this country when it would be so easy to remedy the situation by promoting bicycling. It's such an easy and fun way to get and stay fit. Hi Jane, I just returned from Washington state where I ran into several cyclists biking with big fat tires on snow-laden country lanes, with their dogs running beside them. Very cool. Hi kerry, Glad you enjoyed the piece. And enjoy Odense if you have a chance to visit your friends there. This sounds idyllic. But, for those of us who aren't enthusiastic bikers, I also vote for rail-bus-pedestrian links. I'd give anything to live in a bike-friendly community; I don't think I'd ever bother with my car again. What a way to get around...efficient, clean, and healthy. It's a shame there are not more of these. Hi Ruth, Absolutely. I'm all for any dedicated pedestrian paths as well as more car-free transportation, whether by rail or bus. Hi Sheryl, I agree. It seems that the U.S. is country that respects the car and not the cyclist. That's what I found when cycling all over the country. That's wonderful that Denmark is so pro-biker. You take your life in your hands when you ride one around here (Seattle). When I moved from CO to the Midwest I was used to biking to places nearby--the grocery store, my kids schools. But you just don't see it around here as much. It's too bad. Now both my bike tires are flat from lack of use. My bro, in CO, rides his bike to work most days, CO is a very bike-friendly state--my guess is you've been? Hi Heather, I had thought that Seattle was way more bike friendly. (Sounds like NYC. )That's really a shame. Hi MyKidsEatSquid, I love CO for cycling. Yes, I've biked all over the state and found it extremely bike friendly, unlike, Florida, for example, and many other states in the South where the car rules. Hi Kris, I totally agree. Switching to a more bike-friendly society has benefits all around, including protecting the environment. Thanks for bringing that up. Hi Vera Marie, Not only bicycle clubs, but also city agencies all across the country should jump on this. It's such a great way to implement a healthier cities mentality. Hi Roxanne, Cycling in so many places in the U.S. is a sad state of affairs. I've found some rails-to-trails really nice where you don't have to do much in the way of dodging. Thank you for all this great information. We'll be in Copenhagen in June with kids so it's great to know what a bike-friendly city it is. We're looking forward to sightseeing in bikes. It was amazing to see how bikes were such a part of Amsterdam's culture. Denmark really looks after bicyclists. I didn't know that cycling was such a big part of the country's culture. What a fun way to explore a country. Hi Mary, When I was in Amsterdam (and others places in Holland), I wished that I had a chance to bicycle. Such a bike-friendly country. Hoping to do it down the road.